May 1970 Peace Memorial in Revelle Plaza at UCSD. All photos by Patty Jones. 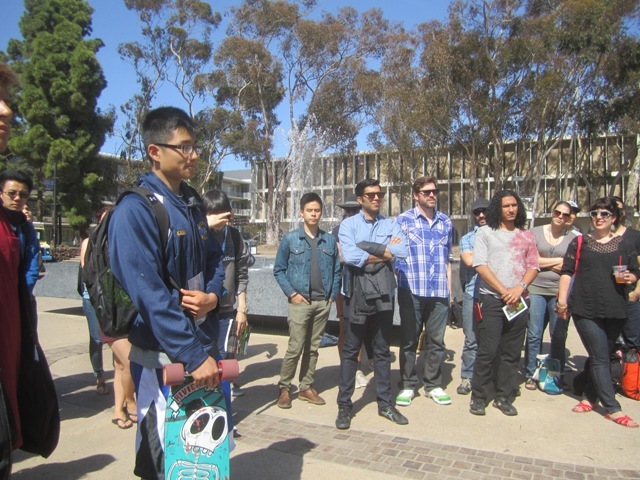 Editor: the following is based on a speech delivered by the author, Niall Twohig on last Friday, May 9th, in front of a group of fifty gathered in Revelle Plaza at UC San Diego to unveil The May 1970 Peace Memorial. The Memorial is dedicated to George Winne, who immolated himself and died as a protest against the Vietnam War in May of 1970, plus it’s dedicated to those students who carried on the May 1970 Student Strike. Author Niall Twohig unveiling the Memorial. 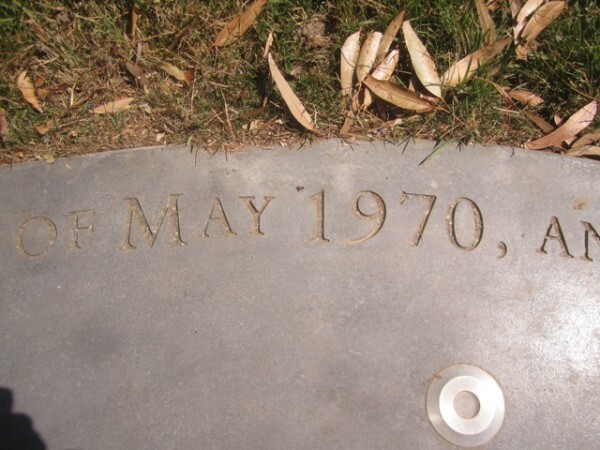 Why a memorial for May 1970? Why a memorial for peace? Why now? To suggest some answers, I want to ask you, the reader, to take an imaginative leap back in time to May 1970. In order to make this leap, we have to remember that the U.S. was waging an unpopular proxy war in Southeast Asia, made all the more unpopular after the invasion of Cambodia at the end of April. If we found ourselves transported to May 1970, this would be all too apparent. We would see the images: the aerial views of bombs upon bombs pulverizing the Vietnamese countryside, images of GIs burning huts, footage of badly burnt villagers running from the firestorm of napalm, photos of rows upon rows of mutilated bodies scattered in the fields and anonymous soldiers packed away in coffins draped in stars and stripes. Those images would be beamed into our homes by television sets that hadn’t yet dulled our senses to reality. Those images would be seared into our minds. And then, on May 4 (just a few short weeks ago, if we’re imagining ourselves back in time) we would have seen the Ohio National Guard’s guns turn on students at Kent State. A week from today, we would see the guns turn on students at Jackson State. Six lives erased. Six more to add to the thousands upon thousands. What would we do if we were transported across time to that moment in history? Maybe we can’t answer that question, but we can think about what we might want given the situation that confronted all of us: Many of us would want the war to end. We’d want others, whose vision was hardened to warfare, to recognize the injustices that we saw. We’d want peace, not as a hollow sign, but as a concrete alternative to an order premised on militarism, racism, sexism, and class exploitation. That’s what student activists wanted that May. They wanted a substantial peace built on brotherhood and sisterhood rather than on imperial hubris and violence. These students acted for that desire through individual and collective protests, each act a flashpoint in a larger constellation of struggle that grew into a nationwide strike that May. Close up of part of the inscription on the Memorial. As part of that strike, activists at UCSD staged protests, held teach-ins, walked out of classes, and occupied departments where war research was conducted. Many of these activities took place in Revelle Plaza, the former center of campus and free-speech area. If you enter the Plaza today and look northward, you might catch glimpses of their ghosts standing alongside the balcony of Urey Hall. If we were transported to May 1970, would we join them? Would we sit-in with them, even if it meant risking expulsion or arrest? George Winne Jr. whose name is engraved alongside the student activists also acted upon this desire for peace. Forty-four years ago, on May 10, 1970, Winne lit himself on fire in this plaza as the ultimate sign of refusal to the war. He carried a sign that read, “In God’s Name, End the War”. Winne died the next day. Over the last four decades, activist histories have been largely forgotten. The histories of anti-war activists, like the ones who staged sit-ins at UCSD, have been hidden behind caricatures of apolitical hippies and Flower Children. The memory of Winne’s self-immolation was buried as well. Many people forgot his anti-war message and his desire for peace. They instead characterized him as a troubled loner whose act pointed to an internal flaw – a psychosis – rather than to a revolutionary desire posed against the psychotic violence of the nation state. Despite pressures to forget, some students struggled to remember these forgotten histories. I was just one among many. Going through old newspapers and archival records, I came across dozens of old pictures of these students at the various vigils that occurred in Revelle Plaza each May for the last four decades. Finding the light of those distant vigils was like finding the light of old stars that shone across the distance. It was like uncovering a hidden constellation. Those photos gave shape to a community that stretched across time, a community that took up a struggle to remember in the face of a power that thrives on our forgetfulness. Today, more than ever, we need to hear that message that Winne and the student activists of May left us. Hearing that message, we might intensify our protest against a war machine that has grown stronger and more pervasive over the last four decades. Hearing that message, we might begin to see what power keeps out of sight and out of memory, whether it is a drone strike, prisoners in solitary confinement, investments in murderous industries, or the histories of activism at UCSD. Hearing the message that Winne and the student activists left us, we might take up the revolutionary task of remembering. As bearers of these memories, we can carry on the long march for peace, and when we reach our twilight years, we can pass the struggle on to those who would be the new bearers of the light. Thanks to all those who supported the project, especially Lianne Twohig, Mollie Rivera, Gary Matthews, Don Wayne, Keith and Marianne Stowe, Rob Gibson, and the workers who made a forty-four year vision concrete. Thanks to George Winne Jr.’s cousin Doug DePalma and his wife Kathy. Doug passed away before the project was complete, but it wouldn’t have been possible without his support. Thanks to The Villagers and The Dimensions of Culture program for creating a backwater to discuss these buried histories. Thanks especially to Jorge Mariscal, Gracy Uriarte, and Allyson Osorio for conspiring on a project that was four-decades in the making. Most importantly, thanks to all the students who carried on memories of Winne and student activism despite pressures to forget. 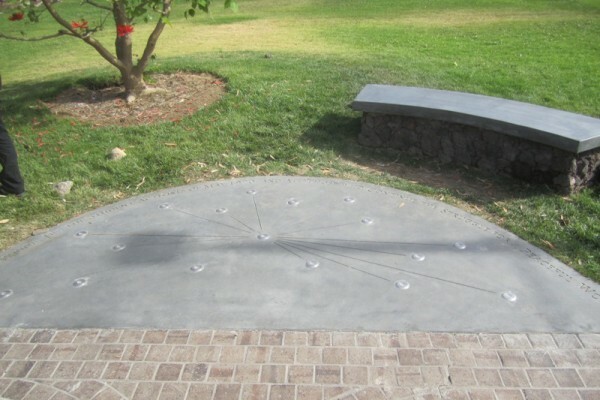 Niall Twohig is a Ph.D. candidate in the Department of Literature at UCSD and one of the main forces to finally having a memorial to George Winne and the May 1970 anti-Vietnam war peace movement on campus.